As the saying goes, “first impressions are everything.” Fair or otherwise, this same rule often applies to the front yard of your home. Horticulturalist Bob Rensel presented on creating a beautiful front yard landscape. 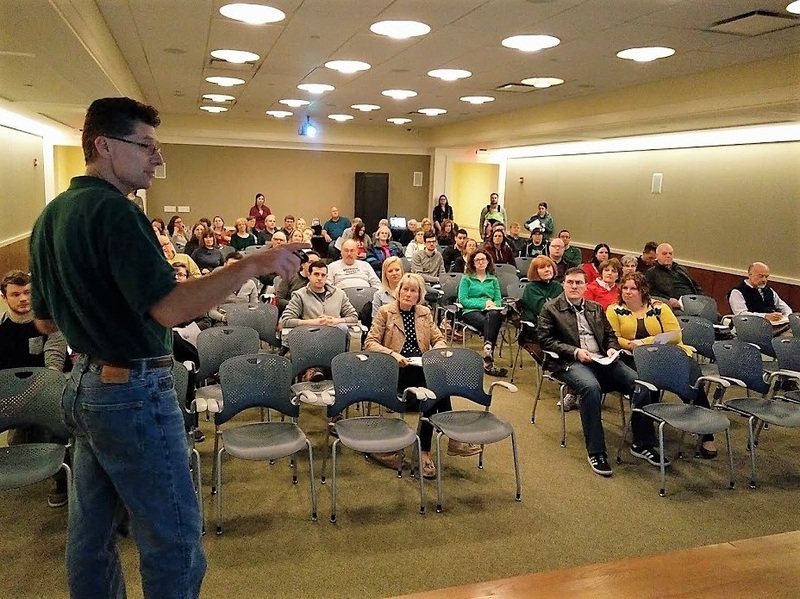 More than 60 attendees congregated at Lakewood Public Library last Saturday, April 8, for our “Knowing Your Home: Front Yard Curb Appeal” free workshop. During the two-hour session, horticulturalist Bob Rensel presented on creating a beautiful front yard landscape that complements your house, is easy to maintain and potentially increases the value of your home. 1. Right spot, right plant. Location matters. When seeking to add a plant or tree to your front yard landscaping, it’s important to consider the desired location with regards to the particular plant’s ultimate size, sun exposure, moisture/drainage and pH requirements. Since Lakewood soil tends to be slightly acidic, some plants, such as hydrangeas and lilacs, tend to flourish in our city while others, such as rhododendrons, are less inclined to grow. 2. Consider design principles. A well-planned design generally makes for strong curb appeal. As such, it’s worthwhile to consider balance and proportion, form (anchor and soften the corners), color (opposites attract), texture (mix it up) and repetition (ties everything together) for your front yard landscaping. Whereas a formal design may create more symmetry, an informal design results in more random placements for ease of maintenance. Proper pruning of plants can go a long way towards bolstering your yard’s curb appeal. Thin dense plants to maintain a clean look while allowing for sunlight penetration. Timing is also important when it comes to pruning: If a plant blooms before July 1, prune after blooming; if a plant blooms after July 1, prune during late winter or early spring. 4. Construct a new flower bed. Complement your existing landscaping by adding a new planting bed at the front corners of your yard or along your driveway or front walkway. Make sure to keep in mind: Right spot, right plant. Use this opportunity to add color, diversity and contrast to your yard’s flora while including features that accentuate your home. And remember: Developing a green thumb can be a lot of fun!